Constant Lem, Book Conservator at the National Library of the Netherlands, reviewed my 18th century French Bookbinding Workshop from last summer, which I taught in the Netherlands. Constant studied Medieval History at the University of Amsterdam. In the 1980s and 1990s he worked as a bookbinder. Since 2004 he is a book conservator at the Koninklijke Bibliotheek in The Hague (The National Library of the Netherlands). Constant is very interested in historic bookbinding manuals and has long been intrigued by the peculiarities of the special French tradition of leather binding. Translation by Herre de Vries. 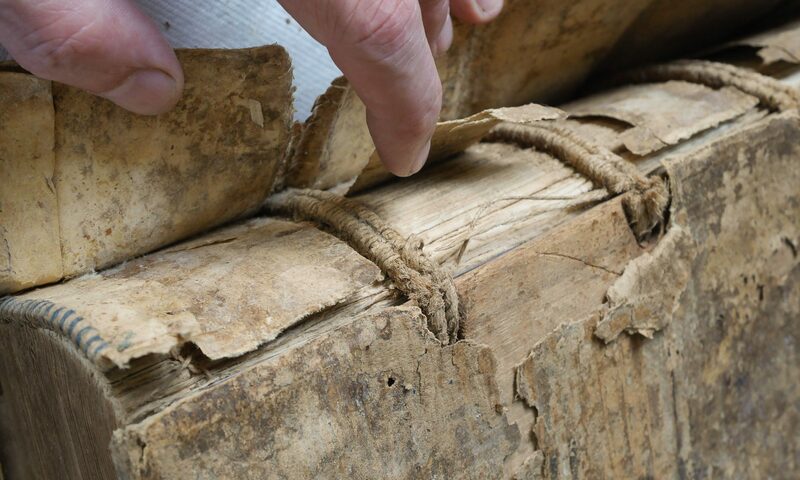 Making models of historical binding structures is a source of knowledge about the old book. The best way to make such a model is by working from contemporary manuals. The oldest known sources have a Dutch origin: Beschrijvinghe des Boeckbinders Hantwerck [Description of the bookbinder’s handcraft] by Anshelmus Faust (1612) and Kort Onderweijs van het Boeckenbinden [A short instruction in the binding of books] by Dirc de Bray (1658). These manuals however are written in such a manner that they contain many unclarities to the modern reader. These can be somewhat clarified by repeated empathic reading and by studying the historical examples of the described bindings: historical bookbinding manuals are a wealthy source of knowledge about the old and rare book, but these bookbinding manuals only allow for a good and thorough understanding through the study of actual books. The most fruitful recreation of an historical model from an historical manual can be done under the guidance of a tutor who has profound knowledge of the manual and who has come across many of its unclarities before, who has solved some, but is continuously open to solutions seen and understood by others, people who have also dug into the subject or people who are completely oblivious yet and can approach it in open-minded fashion. This type of workshop is exactly what the American bookbinder, conservator and tool maker Jeff Peachey offered. The subject of the workshop was the type of tight-back full leather binding which has been employed so ubiquitously on books in eighteenth century France. The place of action was Wytze Fopma’s studio in the Frisian town of Wier, the Netherlands. It was fascinating and instructional from day 1 through to 5. Working in the company of book conservators — professionals from library, archive or private practice, and bookbinders — to construct a tight-back full leather binding, with raised sewing supports and a flush joint was recreated following the eighteenth century French manuals by Dudin, de Gauffecourt, and the plates accompanying Diderot. During the course long forgotten, unused techniques were employed, like the beating of text block and boards with a 4 kilo hammer and trimming the edges using a plough. One not only understands the nature of the work of the bookbinders of let’s say 1750, but one also gains insight into how different materials and a different way of processing them results in a different book. The tactility of the book is remarkably different compared to the models made without the use of mock old materials and without resorting to those obsolete techniques. You understand why boards are being laced on prior to backing and trimming and what is the consequence of backing a book in-boards. You get to understand how the final result contains closely observable and for this binding type very characteristic, but detailed differences. Some of those are described explicitly in the manuals, others can be deduced from what can be seen manifold on the historical examples. Jeff’s teaching method is different to what particularly modern bookbinders will be used to. A cover’s square for many a modern-day trained bookbinder should be exactly 3 and not 2.5 mm, and a 90 degree backing shoulder is 90 degrees, and that’s just the way it is. While Jeff knows his sources damn well and he knows what he is doing, he seldomly gave clear, complete and compulsory instructions. He was well aware of the incomplete, sometimes deficient descriptions in the manuals and invited us continuously to ask questions — without necessarily always being able to answer them — and to make remarks and attempt to clarify up to a point, unclear parts of the descriptions. This ‘open’ approach and the pre-final result — the bound and covered, but unfinished book — seemed to bewilder some of the participants, probably used to clearer guidelines, more stringent instructions and straight lines. This bewilderment evaporated abruptly when the book underwent its final treatments and by applying a simple dotted-pattern surface decoration with iron gall ink and a finish of glaire and paste-wash it suddenly transformed into a historical binding quite convincingly. It suddenly looked all too familiar and many of its previous deficiencies seemed to have disappeared. In reality though they had contributed largely to the satisfying final result! The point being that while making historical models you should avoid observing with the modern eye and from modern concepts. You should put aside — nearly impossible — all you know and can do, the result of two centuries of a bookbinding tradition constantly working more set and more straight, and to try and settle into the old knowledge, attitude and methods with an unencumbered mind and let it work from within you. With his experience and knowledge Jeff Peachey has given us access to that knowledge, learned how to interpret sources and to work according to methods of that period and as a result of that process has given us moments of great satisfaction.